Download a free guide to learn more about the latest medical and surgical interventions. 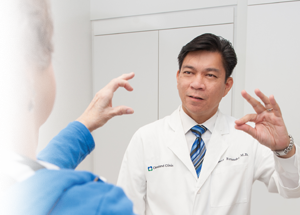 Cleveland Clinic's Center for Neurological Restoration has an integrated, multidisciplinary team offering the latest medical and surgical treatment interventions to patients with intractable movement disorders and other neurological conditions. Our center is one of the most experienced in the world in performing deep brain stimulation (DBS) surgery. This procedure has improved motor function and quality of life for many of our patients. Our specialists are dedicated to restoring your motor function and relieving pain to the greatest degree possible by combining their knowledge and skill with advanced technology. Our patients also receive assistance and support with issues such as depression, nutrition, medication management, patient and family education. To schedule a same-day consultation with our movement disorder specialists, please call toll-free at 866.588.2264 (OH), 877.463.2010 (FL), 702.483.6000 (NV).